Blogs are composed of two main structures: post and pages. New bloggers often struggle with the difference between posts and pages. Your posts are where you’ll publish your main content such as what’s been happening in class. assignment information, documents, and more. They are commonly displayed in reverse-chronological order with the most recent post at the top of the page. Comments – all themes have a link to comments. This is where your readers can click to write a comment in response to your post. 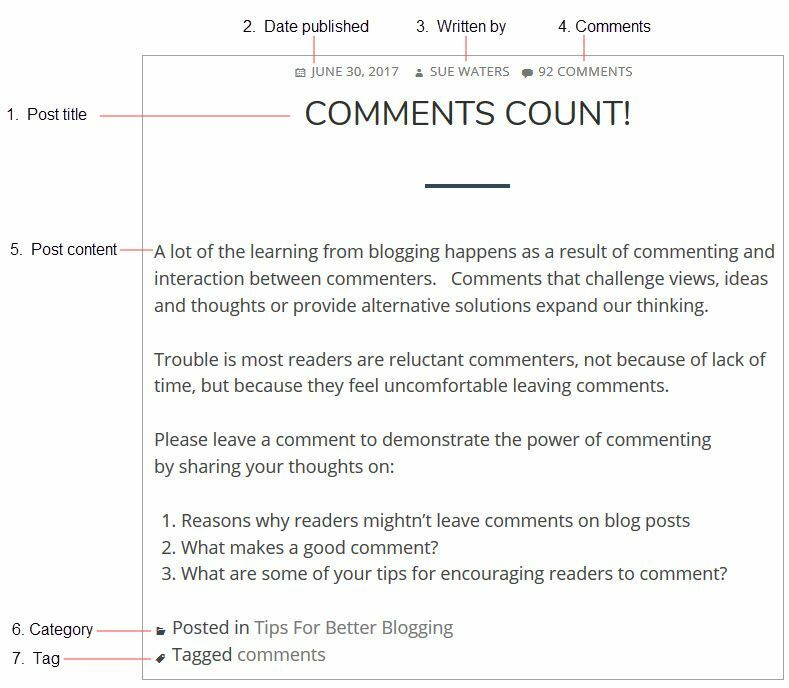 Comments allow students, and other readers, to engage in discussions, share their thoughts and connect with your class blog. There are key differences between pages and posts that are important to understand when working with them. Normally used for information that you want to share with readers but don’t expect to update frequently. Pages don’t have time stamps so don’t show the date they are published. Blog pages can appear any where in your blog depending on your theme. You can change the order pages appear. You can’t assign category and tags to pages. Pages don’t appear in RSS feeds so readers need to visit your blog to view latest page updates. You can create sub-pages which you assign to a parent page to create nested pages. Blog posts appear in reverse chronological order so that the most recent posts is the first post that your readers see. Post are dynamic and updated regularly. Posts have a time show which displays the date and time the post was published. You can assign categories and tags to posts which make them easier to find. Posts appear in RSS feed so readers who subscribe to your blog will receive your latest post in their RSS reader. Posts display the name of the post author.